We're big believers in offering gardeners and garden care professionals the best deal possible. We also know that, as a gardener, there's nothing better than buying an expertly chosen machine, built with the highest quality components, by industry leading manufacturers. Nothing better - except getting one for free. Honda's HHB 25 E is the first of its kind to pack a 4-stroke engine. 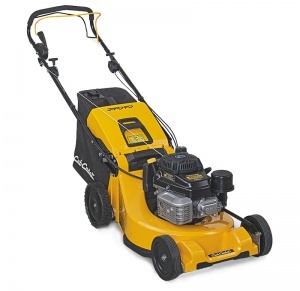 It’s powerful and efficient, both cleaner and easier to maintain than a standard 2-stroke blower. This lightweight blower is perfect for clearing your garden, easily blasting away fallen leaves, twigs and garden debris. With a fantastic mix of intuitive features and world leading technology, the HHB 25 E makes tidying your garden a breeze. At the end of each month we randomly choose a winner from our list of customers - who knows, maybe this months winner could be you? Have you bought a product from us? We want to hear about it! Every review gets you a chance to win. Liking us on Facebook lets you stay up to date with our latest offers and deals. It also gives you a chance to win. Follow us on Twitter to see even more great competitions and deals. 1. The promoter and supplier of the competition is Garden Machinery Direct, whose registered office is at Head Office, 4 Newtown Road, Worcester, WR5 1HF. 2. Employees of Garden Machinery Direct, their family members or anyone else connected in any way with the competition shall not be permitted to enter the competition. 4. Multiple entries are permitted as long as they fall within the spirit of the draw, though fraudulent or suspect entries will be rejected without notice. 5. No cash alternative to the prizes will be offered. The prizes are not transferable. Prizes are subject to availability and we reserve the right to substitute any prize with another of equivalent value without giving notice. 6. The winner will be notified by email or social media within 7 days of the closing date. If the winner cannot be contacted or do not claim the prize within 14 days of notification, we reserve the right to withdraw the prize from the winner and pick a replacement winner. 7. The competition is soley organised by Garden Machinery Direct, and is not affliliated with any manufacturer or social network listed, nor any other party. 8. The promoter reserves the right to publish the name and country of residence of competition winners.